The Friday opener drew just five runners in a maiden $75,000 claimer for juveniles. #2 Zen Deputy finished willingly to be a second after a bit of rough start and raised in class in a sign of confidence by trainer Robertino Diodoro. He exits a fairly decent race and seems likely to produce a forward move with that effort behind him. #4 Mr Larson was well-backed (7/2) in his debut vs. straight maidens and was always outrun; Rafael Bejarano stays aboard, the blinkers go on, a couple of sharp workouts follow, so the son of Tiznow most likely will improve. We’ll use both in rolling exotic play while preferring Mr Larson on top. The second race is another runner affair, this one for restricted (nw-2) $25,000 claiming fillies and mares at a flat mile. #4 Entebbe looks best by default; the Eric Kruljac-trained filly finished a willing third in a similar race last month and today returns to dirt, a surface switch that she should benefit from. She switches to Joe Talamo and should be bearing down late. #5 Sheswildnfree is a bit slow on speed figures but she has good tactical and likely will draft into an ideal pace-stalking position and have every chance. Her maiden claiming win at Los Alamitos two runs back charts well here. We’ll prefer Entebbe on top but use both in our rolling exotics. The Pick-6 begins with the third race, a starter’s allowance middle distance event for $20,000 fillies and mares. #3 Take It Easyplease was beaten as the choice when finishing second in a similar spot last month; she retains Bejarano and her best effort puts her in the thick of it again. #4 Margie’s Minute might have moved too son when second in the same race Take It Easyplease exits; she retains Flavien Prat and with a better timed ride today should be hard to beat. Let’s use them both in our rolling exotics and then have an extra ticket or two keying Margie’s Minute. 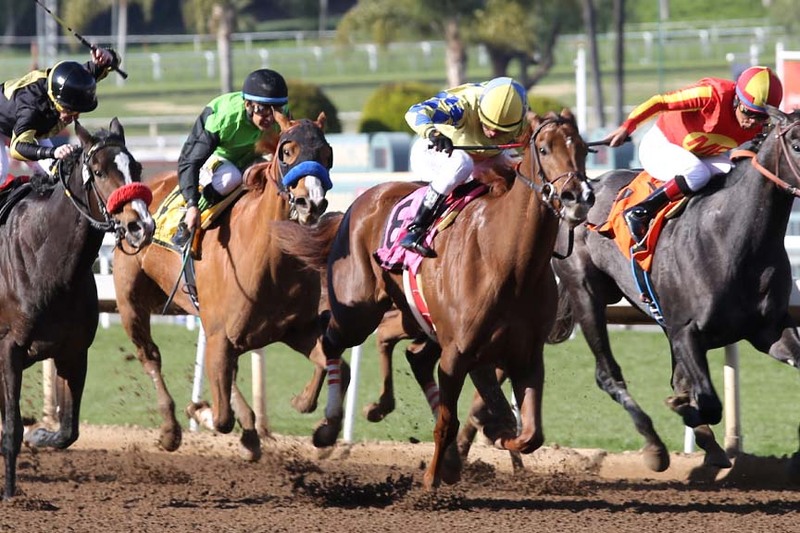 $50,000 maiden claiming sophomore fillies compete over a mile in the fourth race with two main contenders. #4 Space Cadet has the two-sprints-and-a-stretch-out pattern we like; she also is adding blinkers for the first time and retains Bejarano. The Richard Baltas-trained daughter of U S Ranger should be the controlling speed and if she get the trip, she should be hard to catch. #3 C W Road, a closing second in a maiden $20,000 event last month, moves up considerably in class but actually is a solid fit at this based on speed figures. Prat stays aboard and should have this Peter Eurton-trained filly rolling late. Both should be used in rolling exotic play; we’ll prefer Space Cadet on top. #3 Selection seems the solid choice in the fifth race, a starter’s allowance seven furlong sprint for bottom-rung maiden claimers. The son of Candy Ride earned a career-top speed figure when a closing third in a bit tougher spot two runs back and then was no factor when sent over a distance of ground last time out. This extended sprint trip seems perfect for his style and he’s reunited with Baze, who won on him three races back. A sharp recent half mile workout over the training track is another plus. At 3-1 on the morning line he’s a straight play and rolling exotic single. The fifth race is an optional claimer with a convoluted set of conditions. #7 Toomanytomatoes has been freshened since March and has trained like she’s fit and ready down at San Luis Rey Downs for Adam Kitchingman. She’s won over this track in the past, should have enough pace up front to compliment her late-running style, and switches to Santiago Gonzalez. #2 Swissarella stretches out again and likely to will gate-to-wire tactics. She seems a bit suspect given the projected race-shape but her best makes her dangerous. Let’s go two-deep in our rolling exotics and then press on top using Toomanytomatoes. #5 Masochistic has been burning up the track for his first start since finishing off the board in the Breeders’ Cup Sprint at Keeneland last October and seems to have retained all of his speed. He certainly has proven he can fire fresh and really should outclass this field, hence his morning line of 4/5. You may want to save with a ticket or two using #6 Glacken Too, a first-time gelding from the Phil D’Amato barn. Drawn comfortably outside and with a huge, highly-rated win over this track and distance two races back, the son of Smoke Glacken could give the favorite something to worry about if that former doesn’t bring his “A” game. The finale is a maiden claiming sprint for bottom-rung fillies and mares; a little certainly will go a long way. #1 Tooluckysupermoon is the best on paper of the known element; she’s finished in the money in her last pair and her numbers are slowly but steadily rising. The rail post doesn’t help nor does today’s added furlong, but Martin Pedroza remains aboard and most likely will send hard to make the pace and then try to hold her together. A couple of first-timers look intriguing. #2 Tuscan Sun has done some good work in the morning for Karen Headley and should fit with these, while #4 La Baresina finally makes it to the post at age five for Craig Dollase and shows a bullet gate drill at Los Alamitos a couple of weeks ago. Neither will have to be world beaters to fit with these.